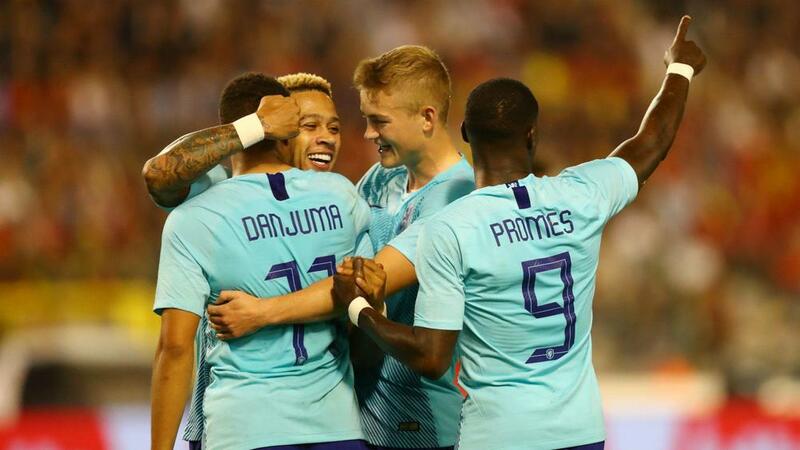 Arnaut Groeneveld's first international goal helped Netherlands to a 1-1 friendly draw and brought Belgium's run of four consecutive wins to an end. Roberto Martinez's side had bounced back in style from their 2018 World Cup semi-final defeat to France – defeating England, Scotland, Iceland and Switzerland – but had to settle for a draw against their neighbours at the King Baudouin Stadium in Brussels. The hosts had started brightly, taking a fifth-minute lead through Dries Mertens' 16th international goal, but were pegged back in the 27th minute when Groeneveld – making his first start for Ronald Koeman's side – slotted in from close range. Substitute Michy Batshuayi looked threatening during the second half, but was unable to find a goal that would have extended the Red Devils' winning streak. Belgium started in ominous fashion and were soon ahead. Donny van de Beek's headed clearance went only as far as Mertens, who cracked a stunning half-volley into Jasper Cillessen's top-left corner from 15 yards. A stretching Romelu Lukaku headed over from Mertens' cross soon after, while Simon Mignolet thwarted a clean-through Memphis Depay midway through the first half. Koeman's side then took full advantage of Timothy Castagne's wayward pass, Depay sliding across the face of goal for Groeneveld to slot under Mignolet from eight yards. Quincy Promes came agonisingly close to handing Koeman's side the lead soon after, but his fizzing left-foot strike from 25 yards crashed back off the post, while Hazard clipped just past the upright as the sides went into the interval level. Belgium's Batshuayi – who replaced Lukaku at the break – and Youri Tielemans both flashed efforts wide of Cillessen's right-hand post within minutes of the restart. The closing stages saw Mignolet paw away Nathan Ake's header, before the lively Batshuayi almost won it at the other end late on, only for Cillessen to push away his instinctive effort, ensuring a share of the spoils.